I'm not talking about stamp-collecting or computer gaming here, I'm referring to one of the most exciting birds of prey that can be photographed in the UK. A master of the skies; fast, agile and a superb hunter. 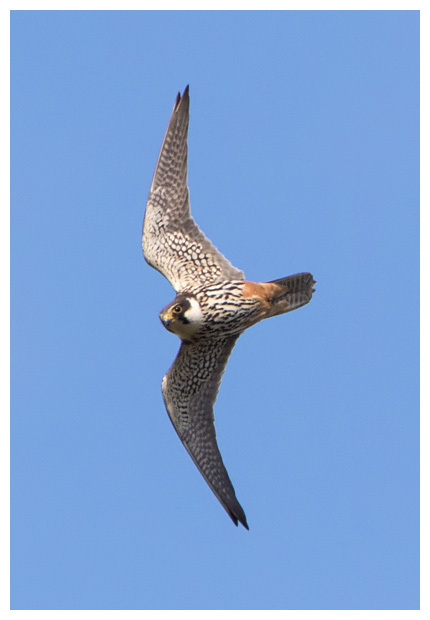 The hobby is a migrant falcon, that arrives in the UK in late April or May, spends the summer here, before returning to Africa again after breeding, usually late September or early October. They arrive en masse and often gather over marshes to feed after the long flight. Here they may also pair up before dispersing to territories across the country to breed. At a distance they appear to be somewhat like a large swift (a similar size to a kestrel), with pointed wings, but are pale from underneath with a distinctive brick-red coloured area beneath the tail, sometimes referred to as "red trousers". Much like the peregrine falcon, it also has a dark hood, with the back, tail and tops of its wings dark grey coloured. The feet are much more delicate than those of a peregrine, but also yellow. And the beak is yellow with a dark tip. Juveniles lack the red patch, have a blue-grey beak and also have a slightly brown hint to their darker plumage, plus their undersides are slightly yellowish. Once paired up, the adults will often return to the same nest used in previous years, if it is available. They frequently make use of an old crow's nest, in tall trees amongst plenty of foliage to help hide it. Laying two to four eggs, both adults will help incubate them until they hatch. This is timed for the period of late summer where there is a plentiful supply of their food available nearby. The adults will then take it in turns to bring in food for the chicks until they fledge. After fledging, there is a period where both the adults and the fledglings share the skies hunting, possibly for the youngsters to learn how to catch their prey, before the adults leave and head south. The juveniles then seem to hang around for several more weeks honing their hunting skills and also building up stamina for flight, so they can follow their parents to Africa. 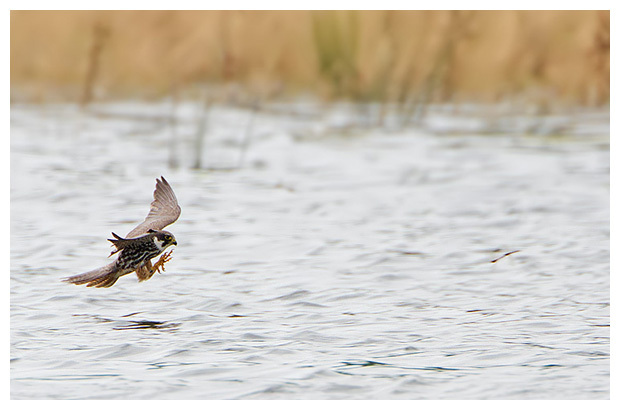 Hobbies hunt on the wing. They can accelerate very quickly and change direction almost instantly. Being so incredibly agile allows them to pursue and catch birds such as swifts, martins and swallows, not to mention other small birds. They usually hunt large flying insects, with dragonflies and damselflies being particular favourites. They have also been known to catch and eat bats. Circling high in the air, hobbies will watch for prey and either dive for it, or chase after it. 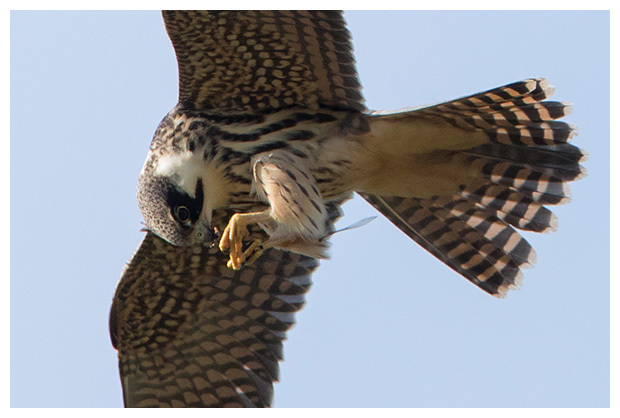 Once the target has been caught, the hobby stops flapping its wings for a moment, and swings forwards its feet, to catch the prey in its talons, before eating it, if possible, on the wing. Prey such as birds though, are taken to a perch to be plucked and eaten. Insects are usually dismantled in the air, with the wings pulled off, and whatever the hobby wishes to eat, consumed. 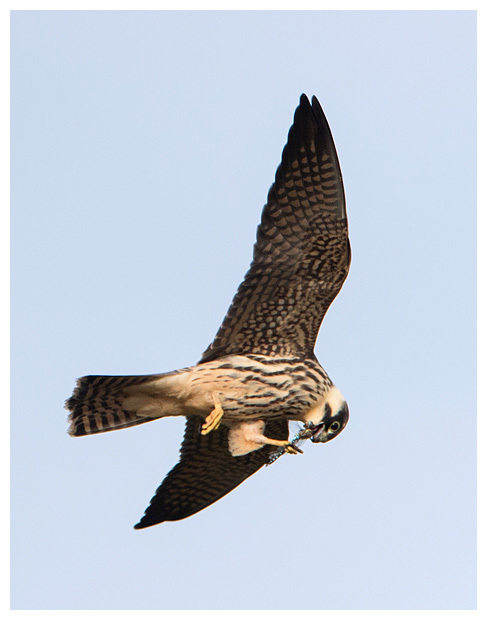 Remains are then discarded, and the hobby begins hunting once more. 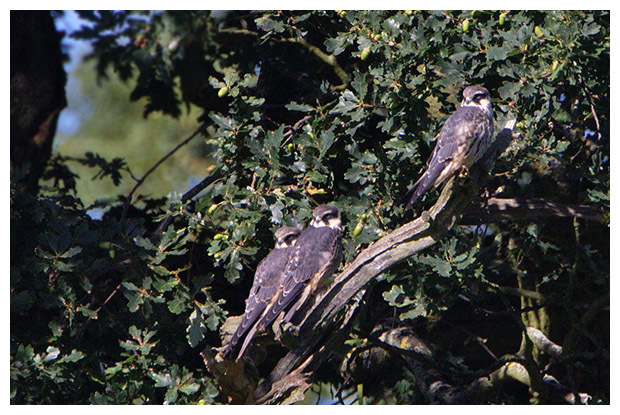 Hobbies tend to share the same hunting areas as hirundines, so will be seen over woods, marshes and gravel pits - anywhere that insects are likely to be found in great numbers. 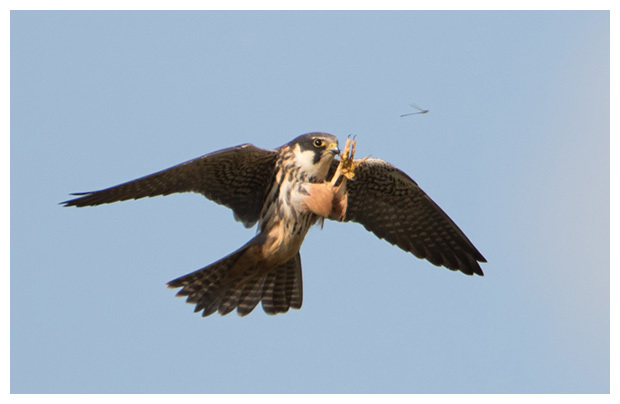 On warmer days when the insects are high up, then the hobbies will follow, hunting hundreds of feet above the ground. 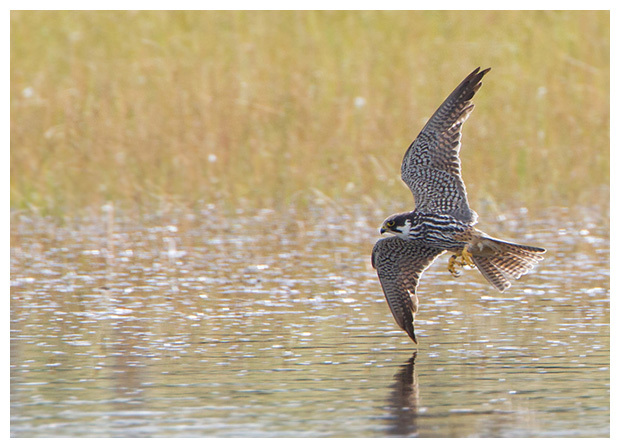 Whereas on cloudier or cooler days, when the insects are struggling to gain enough energy for flight, the hobbies will skim the pools and reeds in search of food. In fact, I have seen hobbies perch up in tall trees on such days, and watch the reeds below for movement, swooping down as soon as they spot any dragonflies trying to warm up. Typically hobbies will favour hunting early morning or late afternoon into the evening. During the warmest part of the day, they tend to perch up somewhere shady, such as a large tree. Challenging I believe is the word to be used here. Hobbies have an uncanny ability to know when you're about to take a photo, and change direction as you do, resulting in a beautiful photo of the sky, or perhaps some reeds it was flying over. 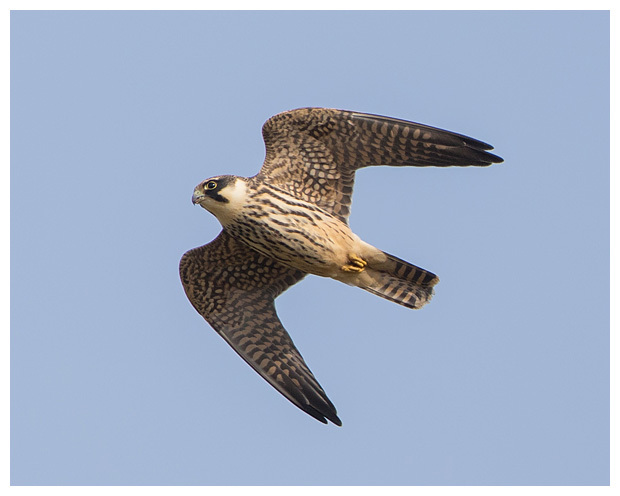 Hence you have to be quick, both in terms of spotting a hobby, and also tracking it. Getting focus-lock can be difficult when they fly so rapidly against busy backgrounds, and their habit of changing line can make photographing them rather frustrating at times. As with other moving targets, it can be helpful to use an expanded focus point (if your camera allows this) and it is essential to engage the tracking focus system here. Needless to say that such a fast bird needs a fast shutter speed to get a sharp shot, though beware of very warm days, as the heat-haze will affect your images, often yielding soft or out of focus images. As with most subjects, the longer you watch them, the more you learn and you will start to see patterns and indicators of what they might be about to do, such as when they're about to stop flying and snap forwards to catch prey. The most important thing to remember here though, is to enjoy it. They are a challenge, but practice most definitely helps here. I also find that hand-holding the camera here is best, as using a tripod / monopod is just too restrictive when trying to follow them. This does get somewhat tiring when you have a heavy lens though! Learning the indicators of when they might be around also helps, so look for signs of alarm among flocks of swallows or martins. 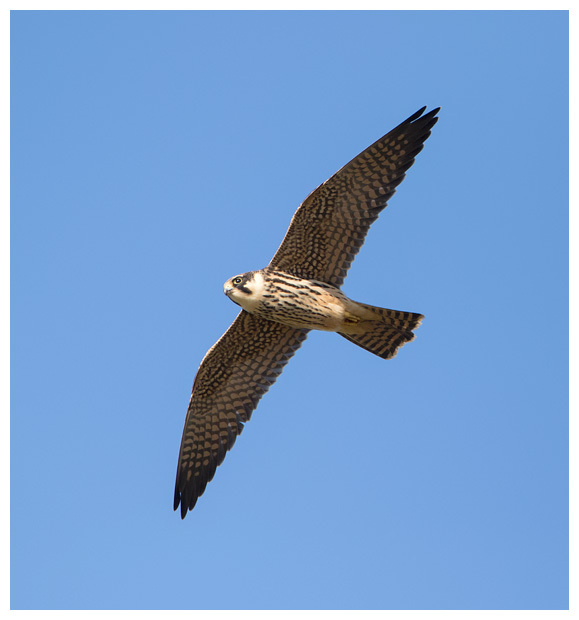 They will make alarm calls when a hobby arrives, and will disperse. And hobbies themselves call too, so learn that sound. They might to be too high for you to see, but you might hear them instead. When you do happen upon an area where one or more might be hunting, watch for patterns in where they hunt, and at what times, or in what conditions. This may help you be in a better spot for the next time they do so, as they typically cover large areas when hunting. Hobbies are only around in the UK for a few months of each year, but are so worth seeking out, as they are such good fun to photograph.